Richard Byrne reminded me earlier this week that URL (uniform resource locator) shorteners are very simple ways to make web navigation more effective and time efficient for you and your students. Here is a comparison of three popular URL shorteners; Google URL Shortener, Bitly URL Shortener, and TinyURL.com. Google URL Shortener - is my personal favorite. Simply copy the original, lengthy URL and paste it into the space provided at goo.gl. Google then creates the short URL that can be copied and pasted as a link into blogs, tweets, or presentations. 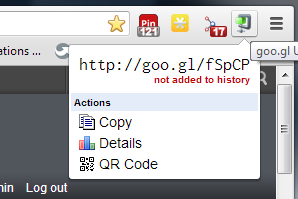 Google URL Shortener becomes even better when the Chrome browser is partnered with the Google URL Shortener Extension. One click condenses the URL from dozens, to possibly hundreds, of characters down to a randomized assortment of five letters and numbers. In addition, this click provides an option of creating a QR code from the URL. Usage statistics for the shortened URL can be tracked through Google Analytics. Bitly URL Shortener - is another URL shortener that also allows the sharing of individual "bitmarks", or "bundles" of bitmarks that can be shared and tracked. So, Bitly is combining the shortening function with a social bookmarking function commonly associated with a service like Diigo. Bitly requires the creation of an account. When social media accounts are linked, Bitly activity from your network members appear in the "network" page. Just as with Google URL Shortenter, simply copy the original URL, paste into the Bitly shortener window, and share to email, Twitter, or Facebook. Shortened URLs can be copied and pasted into presentations, blogs, or forms. Bitly also has their own bitmarklet that can be added to the web browser's tool bar. Finally, Bitly allows the user to create a customized shortened address for easier URL identification, and branding potential. TinyURL.com - is a third, popular, URL shortener that is easy to use. As with the others, simply copy and paste the original URL to create a tiny one. However, unlike the others, TinyURL allows the optional creation of custom URLs. This can be especially helpful in directing students to specific websites, and for creating URLs that are easily identifiable with a particular topic, group, or event. There are numerous classroom uses for short URLs, including; sharing presentations, documents, pictures, or videos. Tracking statistics help teachers identify how many students have accessed the specified digital resource. Short URLs are easier to share, and help limit the number of clicks needed for students to access class-related information. In short, shortened URLs save time. What can your students do with a short URL? Use the comment feature to share your suggested classroom use for short URLs.